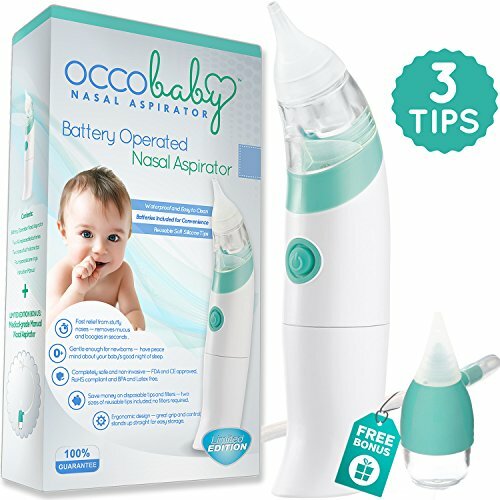 Introducing the new and improved OCCObaby Battery-Powered Nasal Aspirator! A smart, safe, and effective solution for cleaning your favorite nose so you and your baby can have a better night's sleep! The only aspirator that comes with THREE unique suction tips (Power Suction, Long Reach and Gentle). Exclusive to OCCObaby, our proprietary Power Suction design creates the seal at the nostril and increases the suction power to get even the toughest boogers out! Whisper quiet and gentle enough for newborns, this device is completely safe and non-invasive, rigorously tested and FDA approved. Limited Edition includes a "Parent-powered" aspirator with a soft silicone mouthpiece and a soft silicone nose tip. This snot sucker does not require filters. When to use a battery operated nasal aspirator vs. a manual one? You should always use a battery operated nasal aspirator when you need continuous suction for those stubborn boogers or suspect that your baby might have a cold. The automatic aspirator may lower your chances of inhaling the cold virus. You may use the manual aspirator for more precise suction control or as a spare backup for your battery operated device when your baby does not have a virus. Nasal Aspirator with three tips (batteries included), Oral Snotsucker, four spare silicone rings, and a Manual for each aspirator. Rest assured that you are buying the #1 most convenient and easy to operate electric nasal aspirator for your child. You can start using it right out of the box as it comes with two AA batteries. Plus you will receive an oral suction aspirator as a bonus! Add to your Cart now to get it before this Limited Edition set Runs Out! Backed by our 12-month manufacturer warranty and 3-month money back guarantee! WATERPROOF AND SUPER EASY TO CLEAN - After your baby's nasal passages are sparkling clean, simply open the mucus cup and rinse with hot soapy water. You'll never worry again about exposing your baby to bacteria or mold. Sorry, bulb syringes.